Happy Easter Eve (Holy Saturday) friends! J and I went to a big Good Friday service/concert last night for, and that was just the start of our very busy weekend. Today we will be going to birthday parties for two of his great-nephews…such sweet little boys they are. Then, tomorrow we will go to Easter service at church and the to one of his sisters’ houses for lunch with the family. I love that his family is close enough that we can see them fairly often. I wish mine were closer so we could see them too. But, such is life, right?? Did I mention I’m making desserts for the Easter lunch?? Can’t wait to share a couple of those with y’all. But for now, you’ll have to settle for this burger. Let me preface this by saying that I am not a fan of blue (bleu?) cheese varieties…at all. But J likes them and when I saw this burger I knew it would be right up his taste-bud alley. I was right. He love, love, loved the creamy Gorgonzola and piled it high on his burgers. I skipped it altogether because it’s just not my thing…But I did enjoy the chili garlic slaw! And the turkey patty itself was quite delicious. So, if you are a fan of the blue (bleu?) cheeses, you will definitely love this burger, and you should make it…like, yesterday! I hope you all have a very blessed Easter weekend and I’ll be back next week with some delicious dessert posts! To make the chili garlic slaw, heat a large skillet over low heat and add the olive oil. Add the garlic and cabbage, stir to coat, and cook for about 1 minute still stirring. Add the chili powder, brown sugar and sriracha, stirring to combine. Remove the cabbage and place it in a large bowl, add the lime juice and stir again to coat. Place the bowl in the fridge until ready to serve. 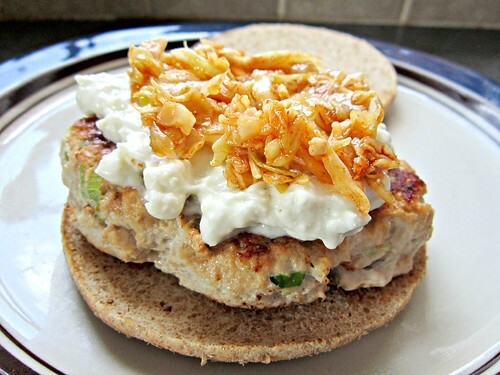 To make the burger patties, combine the ground turkey, salt, pepper, smoked paprika, garlic cloves and green onions in a large bowl and mix until just combined. Heat a large skillet over medium-high heat and add olive oil. Form the burger mixture into 4 equal-sized patties, add to the skillet and cook until brown on both sides, about 5 minutes per side. To make the creamy Gorgonzola, combine the yogurt, 4 ounces of the Gorgonzola, oil, salt and pepper together in a bowl and stir and mash until combined. Place 1 burger patty onto a toasted bottom burger bun, spoon a bit of the Gorgonzola mixture on top of the patty, and top with a generous spoonful of the chili garlic slaw.